Vernarey les Laumes is small but important town with a large and well used railway station offering train connections with Paris, Dijon and Montbard. There's a good variety of shops and a couple of supermarkets, but it could be a good idea to cycle there as it quite a distance from the canal. 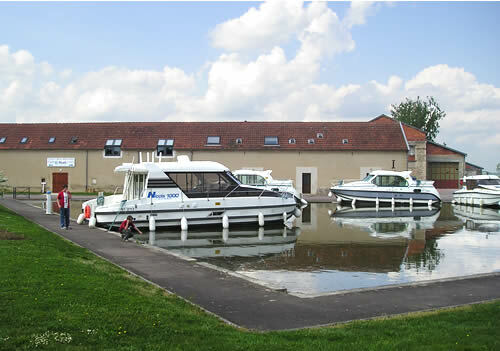 The port has been rebuilt and now offers deeper moorings. The quay is quite calm and you can have an agreeable stay. You are also just a few miles from the abbey of Fontenay and the Roman site of Alesia Sainte Reine. 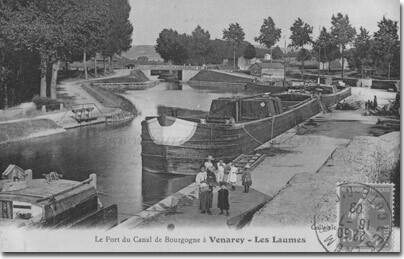 Venarey les Laumes, many years ago, port with wooden hulled barges awaiting cargo. The photo is taken looking up stream.